On a recent trip to see good friends in Hawaii (yes, this story does start on a beautiful island), after trying to kill my friend Bob with a hike, we were too tired to do anything but eat, drink wine and have the TV on while we talked. 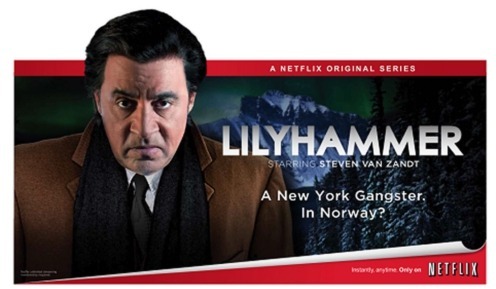 “Have you seen Lillyhammer on NetFlix?” Bob asks. “You mean the Olympics?” I replied. He turns it on, and we begin watching. Van Zandt plays a mob heavie who is forced into witness protection, and chooses to be sent to Lillyhammer because he liked what he saw of it on the Winter Olympics. If you haven’t seen the show, it is worth a watch; just remember to turn on the close caption support so that you don’t miss the translations from Norwegian (a setting I am familiar with from watching Asian Martial Arts movies with my son). I pride myself on my ability to connect the dots, but Bob’s next comment made me realize that I missed one. “He looks a lot different than when he plays with Springsteen, doesn’t he?” Bob said. I had never been a large Springsteen fan, but surely should have made that connection. Springsteen made me think of pop music and benefit shows, not really a band I was into. After the Woodlands show, my wife and I are big fans. It was great weather, the lawn at the Woodlands Pavilion was the perfect spot. We went to see van Zandt as much as Springsteen. But van Zandt wasn’t there; he could not make the NA part of the Springsteen world tour because he needed to be in Norway to film season three. Tom Morello from Audioslave and Rage Against the Machine was the stand-in and a stand-out, and is also on some tracks of Springsteen’s latest album, High Hopes. No opening act, just Springsteen and the E Street Band for three hours. It was a party, my wife never sat, dancing through the songs she knew and the ones she didn’t. Springsteen hadn’t been in Houston in five years, his first appearance here was 40 years ago. The E Street Band had a full horn section, including Jake Clemons, nephew of the late “Big Man” Clarence Clemons. Though not yet possessing the stage presence of his uncle, Jake more than held his own on the sax; hopefully you can tell from the video from the lawn. The second song in the set was the title track from High Hopes. If you haven’t heard it, I highly recommend it. We learned that fans in the front hold up requests on posters, and the most creative ones (or the ones he wants to play) Bruce grabs, shows to the camera, and then plays. There were several of these, but two young men held up one that said they would sing every word of “No Surrender.” Bruce got them up on stage, where they sang/screamed every word, running around the stage to hug as many of the E Street Band-ies that they could. There are some great photos of those two on the Springsteen web site. The new rendition of “The Ghost of Tom Joad” which is on the new album featuring Morello on guitar and some vocals is a great update to this song. Morello’s guitar solo on stage was longer than the album, and just as well done; he pulled the plug on his guitar, smacking it against his hand generating feedback, prompting my wife to give me a “WTF was that?” look. Near the end, special guest Joe Ely joined the band for renditions of Great Balls of Fire and Lucille. Joe didn’t look to comfortable up there with the up-close Springsteen-mike-sharing but the renditions were toe-tappers. The show went up to and a bit past the Pavilion’s 11pm curfew. The fact than van Zandt/Lillyhammer wasn’t there just means we need to see them again. Previous story Can Houston Rockets Choke City 2 turn into Clutch City 2?